As a faithful listener to the Freakonomics podcast, I was very excited when it was trailed that the team would be covering corporate social responsibility. Freakonomics - from the original book onwards - has the reputation of peeling away the layers on an issue or story to get to the hidden truths of why things happen. Sadly, the initial episode (it’s the first of two) was a disappointment. It had some interesting research demonstrating that a company committed to social responsibility could get higher levels of job applications from more committed people. But it meandered around the subject with no anchor based on what this phenomenon actually is, and why it’s happening. Without such an anchor, it frequently switched from CSR-as-business-practice to CSR-as-philanthropy to CSR-as-buying-political-favours, apparently without insight that these might be different things. Well, we all have off days. My suspicion is that the team got this interesting research example about ‘moral licensing’, how people choose to do the right thing - or not - in the workplace (which is genuinely interesting, although there is more detailed and relevant research out there, such as that reported in Robert Cialdini’s book Pre-Suasion) and had to find an interesting narrative hook to hang it onto. The CSR angle seemed like a good one, but it unintentionally broadened the scope beyond what the research actually covered. It made me realise, though, how much harder it is to get your head around this whole corporate social responsibility phenomenon if you don’t have the context for why it happens, and therefore what distinguishes it from some of the background noise. Of course, like everyone else, the Freakonomics podcast dropped in the Milton Friedman quote “the business of business is business”. It’s a good place to start, because it goes to the heart of what has changed. The actual quote, which is often misunderstood through being shortened, said that the sole purpose of business was to maximise profit and returns to shareholders so long as it stays within the rules. That ‘so long as it stays within the rules’ clause is important. Friedman wasn’t saying that business could do any evil required in order to make the most profit. He was saying that it was someone else’s job to establish what society expected and then to put this into the form of legislation. It was a view that suited a time when business and society were viewed as two separate things. Indeed, Aneel Karnani highlighted this Friedmanite misconception when he argued that if the interests of a business were not aligned with the interests of society, then the chief executive had no right to seek societal benefit because it would be to the detriment of the company. That is an ideological position that only makes sense if you believe that business and society are two wholly separate and independent entities. If business is a sub-set of broader society, then you are led to the observation that if your business’s interests are not aligned with the interests of society, then your business has a problem that it might need to fix. 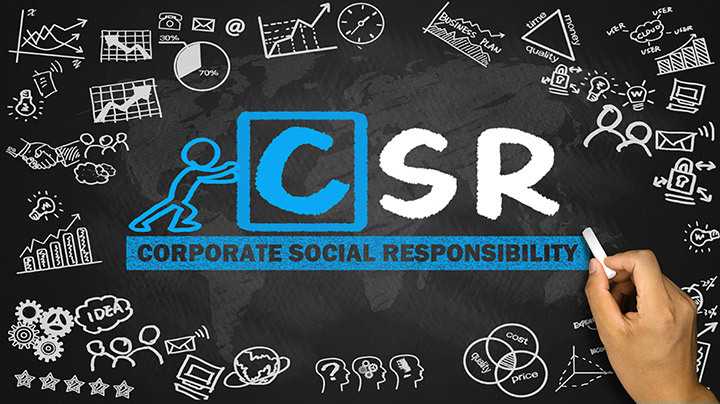 And that’s the starting point for the context of where CSR has come from. The explicit aim of most businesses is to create long-term value. Recent history shows that, although you can make a short-term killing in a crisis, creating long-term value is best achieved within a stable society and a healthy environment. And if your business owners and executives are human beings that live in society, who have children whose future they want to support, then those things are just as important to them as they are to any of us. We know that we, as a species, can destroy our own life support systems. We are sometimes that stupid. Someone did cut down the last tree on Easter Island and goodness only knows what they thought they were doing when they actively made themselves extinct in that way. But businesses, being amongst the most pragmatic institutions we have, might be expected to realise that it’s not a winning formula for the long-term. So businesses are engaging with human rights in their supply chain because it is unacceptable to modern society that there should be such abuses. They are engaged with the environmental impact of their products because unsustainable products will eventually become unprofitable - or we will lose our ability to thrive on this single fragile planet, at which point shareholder value becomes a pretty meaningless concept. But in particular, businesses are engaging with these issues because society - in its many forms of expression from government to consumer to civil society - expects them to. “The sole duty of a business is to make profit” is an ideological position - it’s completely invented. In truth, the purpose of a business is whatever we collectively agree it is. And society right now expects businesses to create their profit in a way that is beneficial to society, not detrimental. And it’s a moving target. Society’s expectations on business change and evolve over time. Tax wasn’t an issue ten years ago. Now it has become one. Plastic waste in the ocean wasn’t a hot topic just last year. Now it’s the thing everyone is scrabbling to respond to. And businesses have been quick to act because they do understand that responding to societal expectations is essential to their commercial future. The roots of why this changed can be found in the 1980s, when the Thatcher and Reagan governments broke the previous consensus of active balance between economic and social interests by actively deregulating the market, fuelling the growth of powerful multinational corporations. Whether you see those actions as a good or a bad thing is irrelevant - what they did was to create more powerful global businesses and that led to a backlash when initially those businesses had significant power without apparent accountability. It may be that it is good for us that there is significant power in the hands of pragmatic, problem-solving innovative institutions. But that power certainly, like every other form, needs to be held to account. And businesses quickly came to realise that they had to adapt to this new reality, and take on the responsibility inherent in their position, or else they would become seen as mad dogs that must be controlled - and that would take more onerous forms that would be bad for business. So CSR is not a management fad - it is a response to the fact that (a) businesses are a part of society, and realise that they have a role to play in supporting the health of that society and (b) businesses have become increasingly powerful and, through a variety of mechanisms, power should be held to account. Twenty years ago, when people were increasingly framing the term corporate social responsibility in its modern usage, there were many who conflated this with corporate philanthropy. And, as the Freakonomics podcast showed, particularly in the US there are people that still do. It’s not that a socially responsible business never uses donations as a vehicle. But the idea that you make your money without let or hindrance, and then get some social credit back by making a donation - that is not corporate social responsibility as we understand it. Donations need to be seen within the overall context. It’s great when companies seek to actively invest in the communities where they’re based, or seek to address issues that may be connected to their business or may be of particular concern to their customers. But giving some money away is no defence if the company is benefiting from child labour, polluting the environment, treating its employees badly and selling toxic products to its customers. Surely that’s no longer a controversial statement. Is it?